The Macondo Well Deepwater Horizon (DWH) rig explosion in the Gulf of Mexico resulted in the largest accidental oil spill in U.S. history. The spring 2010 spill caused widespread destruction to Gulf Coast communities, numerous habitats, and species. The Gulf Research Program of the National Academies of Sciences, Engineering, and Medicine (NASEM) sponsored a study to inform monitoring and evaluation of restoration activities in the Gulf. 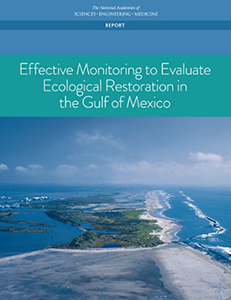 The results, contained in the NASEM 2017 report, Effective Monitoring to Evaluate Ecological Restoration in the Gulf of Mexico, identify best practices for ecological restoration in the Gulf. The report recommends that all restoration monitoring activities clearly define specific, measurable objectives; adopt rigorous statistical monitoring practices; and institute a well-designed data management plan in order to manage the restoration process effectively and inform the restoration programs and public about how the funds are being spent. Among the nation’s leading experts in ecological restoration theory and practice, Ron Thom, PNNL Staff Scientist Emeritus, was invited by the NASEM to participate on the Committee on Effective Approaches for Monitoring and Assessing Gulf of Mexico Restoration Activities. “The work we had done at PNNL’s Marine Sciences Lab in Sequim had true relevance to this massive issue, and our work in adaptive management and environmental management was a significant contribution to the report,” explained Thom. As a member of the panel, Thom helped develop guidance on best practices for monitoring, evaluating, and adaptively managing DWH restoration progress. He and committee member Peter Doering of the South Florida Water Management District co-authored the report chapter on adaptive management—“How Monitoring Improves Restoration Effectiveness.” The chapter first describes how to apply adaptive management to enhance restoration effectiveness, focusing on the project and beyond-project scale—that is, tributary, estuary, program, region, or basin-wide scale. Then it describes key elements needed to support adaptive management and monitoring of Gulf Coast restoration. AM is a structured, iterative process for robust decision making in the face of uncertainty. It allows regular modification of management actions in response to new information and to changing environmental conditions. It is aimed at reducing uncertainty over time via system monitoring. As a fundamental part of restoration projects, effective monitoring focuses on three areas: construction, performance, and adaptive management. It should be conducted to assess whether projects are actually built/implemented and whether they initially function as designed; whether restoration goals and objectives have been or are being met by the implemented projects; and to inform restoration adaptive management to improve the design of future restoration efforts, increase ecosystem understanding, and increase the effectiveness and longevity of restoration projects. After publication of the report, NASEM staff and peers in the Gulf selected Thom as one of three panel members to speak about parts of the report at a special workshop held in New Orleans in June. “The one-day workshop convened those involved in ongoing DWH oil spill restoration monitoring and decision-support efforts and those implementing large-scale coastal monitoring programs elsewhere. It included discussions about outcomes of the NASEM report and solutions for overcoming challenges in implementing restoration monitoring. The goal of the workshop was to identify the challenges with implementing restoration monitoring that supports the assessment and feedback necessary to improve future decisions, and discuss options and provide solutions that realistically help overcome those challenges. “Adaptive management was one of the key topics the program managers in the Gulf wanted to discuss further,” Thom explained. “The whole experience was an honor for me,” he said. Members of NASEM, the Division on Earth and Life Studies, Ocean Studies Board, Water Science and Technology Board, as well as the Committee on Effective Approaches for Monitoring and Assessing Gulf of Mexico Restoration Activities contributed to the report. It is expected to have a significant impact on worldwide ecosystem restoration activities that are estimated to cost $18 billion globally, and particularly on ecosystem restoration being conducted in the Gulf of Mexico as a result of the spill. The report can be downloaded from the National Academies Press website.